THE FMA movis is out in japan !! will the dvd be out in australia ?? will the madman ppl be holding this FMA movie on big screen ?? The other topic does have lots of spoilers in it, though. So be warned. And to answer your questions, I'm sure the movie will be released in Australia - but probably not until after all of the TV series has been released, since the movie is set after the series. I have no idea whether it would get a big-screen release, but I greatly doubt it. Now if the series had been shown on TV here (like in America... lucky Americans!) there might be a chance, but since the series is only on DVD and I doubt that the movie would make sense on its own, it's not very likely to get a cinema release here. We are Team Rocket! All your Pok�mon are belong to us! Perhaps leave this thread open, so we can have a movie thread without series spoilers? Then it can be updated with release news as it comes and people like me don't need to worry about too many spoilers? 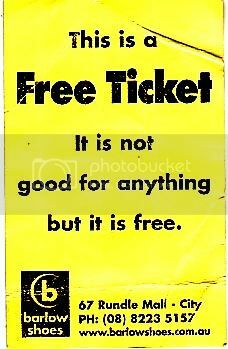 Want a FREE TICKET? Click here!! That sounds like a good idea to me. I certainly don't want to be spoiling the movie (and therefore the series ending) for other people! Location: Wouldn't you like to know. Movie has already hit the US, but the series has alredy been completed here. Fullmetal Alchemist rules, as does almost any anime. I don't care if you disagree. You are nothing anyway. ...that made no sense whatsoever. To my knowledge the OFFICIAL release of the series is only up to DVD 3 (which I'm STILL waiting for ) and I haven't heard of it being on Tv so how is it finished? Currently the series has only been shown up to episode 26 in America, and they certainly don't have the movie yet. It hasn't been released on DVD in Japan yet, either.